In a brief prologue, Bassani makes clear that the members of the Finzi-Contini family died in the Holocaust: “for Micol, the second child, the daughter, and for her father, Professor Ermanno, and her mother, Signora Olga, and Signora Regina, Signora Olga’s ancient, paralytic mother, all deported to Germany in the autumn of ’43, who could say if they found any sort of burial at all?” At this early point in the book, we do not know anything about these characters except their names, though they will go on to populate the narrator’s emotional universe. They are introduced under the sign of death, and we read about their friendships and enmities and love affairs knowing that all such complications will be annulled just a few years after the action of the novel ends. The gulf between the values of life and the manner of death is especially wide in the case of the Finzi-Continis, for the family was defined above all by its aloofness from the Jewish community of Ferrara. For one thing, the Finzi-Continis were much richer than their neighbors. Their ancestor, Moise—part of the first Italian Jewish generation to be emancipated from the ghetto—acquired a large tract of land near the city wall of Ferrara, and the family built a magnificent estate there, complete with a magna domus or “great house.” This is the “garden” of the title, which is not an ordinary flower or kitchen garden but a vast walled enclave. In effect, the Finzi-Continis have retreated into their own world. It is not hard to guess that B. is destined to fall in love with Micol, or that the love will be unhappy. 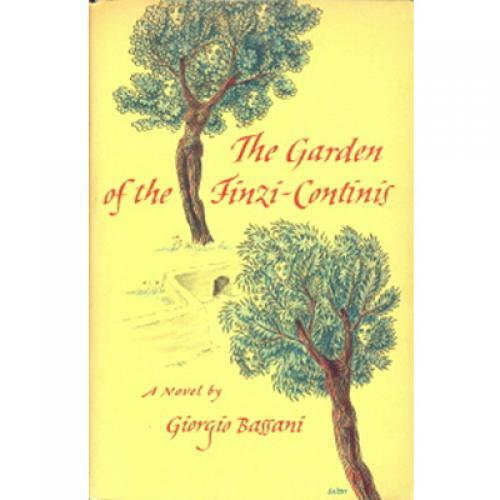 (In this sense, The Garden of the Finzi-Continis can be compared to Evelyn Waugh’s Brideshead Revisited, another novel about a middle-class boy who falls fatally in love with an aristocratic family.) The course of their adult relationship is foretold in an incident when they are about twelve years old. Micol invites B. to climb over the garden wall, but by the time he convinces himself to do it, she has disappeared back into the house. Oh, it still took very little to be offended by it! It was enough, say, to pass along the endless outside wall … or else … overlooking the park, to peer through the forestlike tangle of trunks, boughs, and foliage below, until you could glimpse the strange, sharp outline of the lordly dwelling, and behind it, much farther on, at the edge of a clearing, the tan patch of the tennis court: and the ancient offense of rejection and separation would smart once more. Instead of giving themselves so many airs, they would have done much better … to remember who they were, where they came from, for it’s a fact that Jews—Sephardic and Ashkenazic, western and Levantine, Tunisian, Berber, Yemenite, and even Ethiopian—in whatever part of the earth, under whatever sky History scattered them, are and always will be Jews, that is to say, close relatives. At synagogue, the narrator’s father sneers when he sees the Finzi-Continis avidly kissing the Torah scrolls: “prompt to lean forward impetuously beyond the bench, kissing as many mantle hems as they could, with an almost indecent eagerness, greed.” Absurdly, this spectacle of piety only confirms the narrator’s father’s belief in the Finzi-Continis’ “subterranean, persistent anti-Semitism”: In being more Jewish than the Jews, they are betraying the Italian Jewish consensus, and thus can be considered “objectively” anti-Semitic. This paradox is confirmed when the Finzi-Continis stop attending the main synagogue and set up their own exclusive chapel. It is as though they are claiming Jewishness for themselves, and thus denying it to everyone else. Slowly, first with one leg, then with the other, I climbed onto the bed. Now I was lying on her with my full weight. I kept blindly kissing her face, succeeding only rarely in gaining her lips, never managing to make her lower her eyelids. Finally I hid my face against her neck. And while my body, as if on its own, thrashed convulsively over hers, motionless as a statue beneath the blankets, suddenly, in an immediate and terrible sundering of my whole self, I had the distinct feeling that I was losing her, had lost her. The mystery at the emotional heart of the novel is why Micol cannot respond to B., who in so many ways seems like her perfect match. That itself may be the reason, since Micol cannot imagine a love based on friendship. “Love—at least the way she imagined it—was something for people reciprocally determined to get the upper hand, a cruel, fierce sport … to be played with no holds barred, and without ever calling on goodness of soul or sincerity of purpose to mitigate it.” Bassani’s insight into the perversity of desire echoes Proust’s. Yet at the same time it is clear that their shared Jewishness is also part of Micol’s inability to see B. as a lover: “How were we to act? Become engaged, for instance, with the consequent exchange of rings, visits of parents, et cetera? What an edifying tale! … And what smug satisfaction, what pious satisfaction, for everybody, when we appeared together at the Italian synagogue next Kippur. … Some, on seeing us, would surely bless the racial laws, declaring, in the face of such a splendid union, that there was one thing still to say: every cloud has a silver lining.” The Finzi-Continis are defined, after all, by their “offensive” separateness. To become ordinary Jews, just another married couple in synagogue, would violate Micol’s deepest self-image. In the same way, Bassani seems to imply, anything he might add about Micol’s fate would no longer really concern her—not her as an individual, the way she has appeared in this novel. In defiance of the Holocaust, he claims the Jamesian right to draw the circumference of the story where he wants it, where it is most artistically fitting to end. In this way, Bassani restores at least the illusion of uniqueness and agency to Micol Finzi-Contini. It is the only gift he can make her—and it is the one that such a proud person would want most of all.